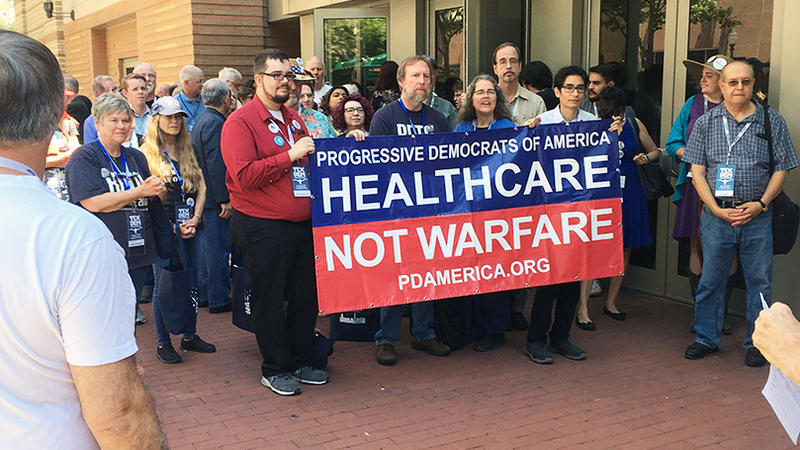 In the picture above the Houston party club is supporting an event organized by the Progressive Democrats at the state Democratic convention. We’re also involved on a number of other fronts: we’re active with Unite Here Local 23 in the fight against United Airlines; we participated in the Democratic Party at their state convention in Fort Worth along with Our Revolution. At the convention, we supported 19-year-old Mike Floyd getting elected as state treasurer. He is very progressive and is a member of Our Revolution. Last week we actively participated in the recent Gay Pride Parade. On the Houston club’s activities in June: Well, first we have recruited more members and they are a diverse lot. We are maintaining the trend of increasing the number of women, people of color, and union members. We are also involved with Unite Here Local 23 in their fight against United Airlines. Presently we have around 4-5 members from that union in our club now. Our members have been involved with several actions against ICE and Trump’s polices against immigrants. We had comrades who just got back from a demonstration of 1,000 at the border in Brownsville. The Houston club also recently had a movie night and 25 people showed up. Movie night is a regular once-a-month activity: at the last one 2 new members joined. The June club meeting was the smallest we have had in over a year: 19 people attended. The size of the meeting was due to several factors that are not politically related. Of those in attendance was 1 Asian, 7 white, 5 Hispanic and 6 African Americans. Some 6 of the 19 were women. Of the women 1 was Asian, 1 was Hispanic, and 4 were African American. We also recently had a new type of event organized by TK who is a full-time organizer for the Texas Organizing Project. It was called “Artivism,” a cultural get together at the party headquarters. It was successful and we sold several Marxist books from our store. We will do this again on July 27th with a DJ and a political Hip Hop band. Finally, we also just had our Houston Socialist Reading Group meeting which gets together once every 2 weeks. The subject was: “Why Does the Electoral Struggle Matter,” a critically important issue in light of what’s at stake in the November mid-term elections.